As yellow finches darted through towering sunflower plants on a recent August morning, several volunteer gardeners were busy pulling weeds at the West Bloomington Active Gardens (WBAG) and Sunnyside Garden at the west end of Illinois Street. 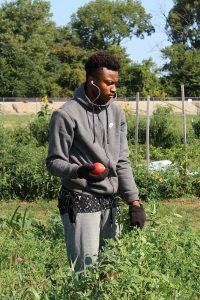 Richard Bullock, 18, of west Bloomington, was one of the first Young Gardeners interns in a joint collaboration of West Bloomington Active Gardens and Boys & Girls Club of Bloomington-Normal. 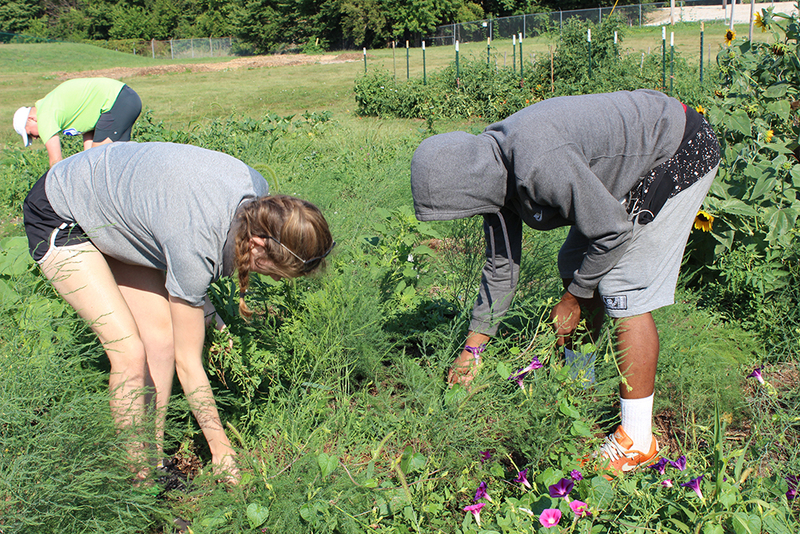 Richard Bullock, 18, and Ednita Williams, 15, both of west Bloomington, pulled bind weed tangled around asparagus plants. They are the first Young Gardeners interns in a joint collaboration of WBAG and the Boys & Girls Club of Bloomington-Normal (BGC). Each intern committed to contributing five hours a week on garden-related projects over the course of 10 weeks between June and August. In return, they will receive an honorarium for their commitment. Both interns worked at pulling weeds, planting carrots, tomatoes, squash and flowers and tending the compost pile over the summer. In addition, they worked with children enrolled in the Grow Your Garden program at BGC. Children in grades K-5 visited WBAG on Mondays to tend their plots, harvest produce and return it to BGC where it was cleaned and distributed to their families. Bullock learned that “you don’t always have to go to the store to get your food,” adding that having access to a community garden can provide healthy alternatives to store-bought food. Toward that end, WBAG holds the Really Really Free Market on Sundays at the gardens supplying local residents with produce grown in the garden. WBAG co-founder Colleen Connelly said she was surprised to find that potatoes were among the most popular items at the free market. As part of the free market many weeks, a local chef teaches attendees how to prepare produce from the gardens. The Young Gardeners also worked at the free market, forming relationships with attendants at the event. Bullock has fond memories of gardening with his grandmother. His summer internship at the WBAG helps him relive those memories. He looks forward to studying the culinary arts after finishing one more semester at Bloomington High School. 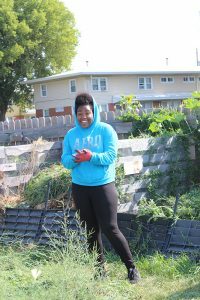 Ednita Williams, 15, of west Bloomington, was one of the first Young Gardeners interns in a joint collaboration of West Bloomington Active Gardens and Boys & Girls Club of Bloomington-Normal. He enjoyed working with the youth from BFC, where he used to be a junior staff. “I like to teach them life lessons and teach about plants and bug,” Bullock said. Williams learned about the internship from BGC. She recently arrived in Bloomington to live with an aunt after her grandmother sent her from Chicago to the safer environment in the Twin Cities. She admitted she knew a bit about gardening before arriving, but “this expanded my knowledge.” One thing she didn’t like about the internship was encountering bugs. “I don’t like bugs,” she said in explaining why she was wearing a hooded sweatshirt and sweatpants on a hot summer morning. Both Young Gardeners said the work is hot, but they would recommend the internship to other students. A $1,250 General Grant from Illinois Prairie Community Foundation helped fund the Young Gardeners program while also providing West Bloomington residents access to fresh produce. Connelly is no stranger the impact that the Community Foundation and its programs have on the community. She was a member of the first class of Youth Engaged in Philanthropy (YEP) and WBAG received a $4,000 grant from YEP in 2017 to purchase 70 fruit and nut trees. If you would like to help fund more programs like this in the community, please donate to the IPCF Annual Campaign which funds the General Grants.